Duke Memorial volunteers have the opportunity to help families that would otherwise be homeless. How? By agreeing to serve the Families Moving Forward guests on April 29-May 2. Needed are cooks to provide food for each evening, people to be evening hosts (welcoming and eating with the guests), and child care folks to take care of children under 5. Please volunteer by checking in with Roger Loyd, our FMF coordinator, at roger.loyd@duke.edu or 919-452-7802. Thanks! Last month, the Special General Conference of the UMC voted to uphold and more vigorously enforce denominational restrictions against the ordination of LGBTQ+ individuals, against our clergy performing same-gender weddings, and against those weddings being held in our churches. This ruling was deeply troubling to many in our denomination and here at Duke Memorial, where a majority of the congregation—guided by the Holy Spirit, the example of Jesus, and their understanding of God’s word and call—support full inclusion of LGBTQ+ people in the life of God’s church. The UMC’s adoption of the Traditional Plan, the crisis of faith and denominational identity being experienced by many Methodists, and most importantly, the very real peril inflicted on God’s LGBTQ+ children as a result of the UMC's stance, compel us to act. On Tuesday, March 26, Church Council approved a statement of our goal to be a fully-inclusive church, in conflict with the UMC’s policy denying ordination and marriage to LGBTQ+ persons. Recognizing the variety of opinion on this issue and the best way to move forward, Church Council also approved the formation of a task force to recommend next steps, timing, and implications of various actions, for consideration by Council. We believe in the constructive possibilities of difference in this and all matters. If you would like to serve on the task force, please contact Pastor Heather Rodrigues or Council Chair Ashley Hairston. The task force will begin work immediately. 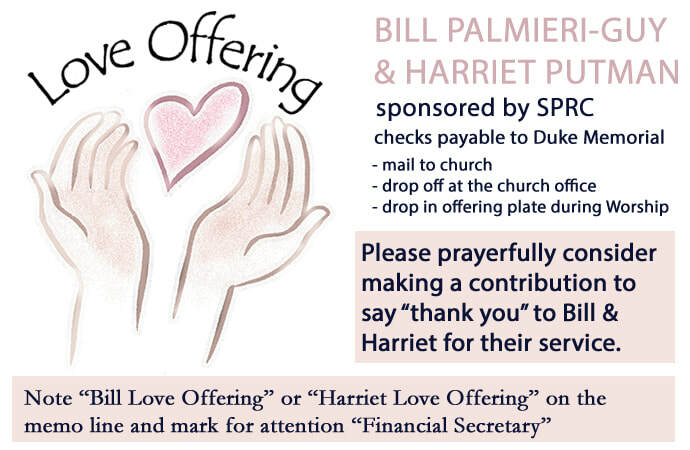 In recognition of her 19 years of dedicated service to this congregation, SPRC would like to invite you to contribute to a love offering for Olivia. It is our goal to raise $12,500, which would sustain her salary through the 1-year mark of her injury and provide her the space she needs to continue physical therapy and healing. To contribute, please visit Olivia’s GoFundMe page by clicking HERE. GIVE to UMCOR through Duke Memorial. 100% of your giving is tax deductible and goes directly to hurricane relief. ORGANIZE Flood buckets and hygiene kits here at church. See a ministry team member if you can lead this effort. BE TRAINED to lead a team. Several Early Response Team training opportunities are coming soon. VOLUNTEER LATER Schedule a weekend or week off now for the Spring so you can participate on a work team.